Summertime is one of the weaker Ub Iwerks ComiColor cartoons, in my opinion, but it features the return of Old Man Winter, who was in the cartoon Jack Frost that I posted the other day. It was definitely influenced by the Disney series of season-based Silly Symphonies… because Iwerks directed Springtime (1929) Summer (1930), and Autumn (1930) for them. It also features a very racy scene for the time of silhouettes of trees turning into silhouettes of rotoscoped dancing ladies. In spite of some very good moments, this cartoon is greatly weakened by having only one design for a centaur, and reusing the animation of him relentlessly. 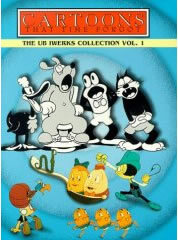 This cartoon, along with almost all of Ub Iwerks cartoons made for his own studio, are available on the excellent DVDs The Cartoons that time Forgot Volume One and Volume Two. This cartoon is on Volume 1. Whoops, I thought I had published this on March 30th, but I just saved it… here it is now. Our monkey of the week for two weeks ago! I knew nothing about this cartoon previous to finding it on youtube, but finding it is like finding lost pirate treasure. 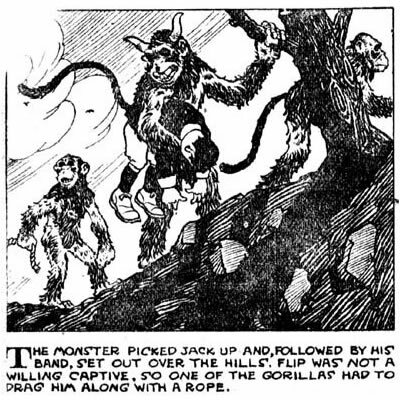 It is awfully bizarre and interesting, and it stars a monkey in a fez, so it is right up my alley. It’s pretty amazingly raunchy for the time period, too… monkey boobies are prominently featured. It’s made by Les Elton and is from 1931. I’ve never heard of Mr. Elton previous to this cartoon. Googling for Mr. Elton brought me some interesting information about him at the Stripper’s Guide blog, and, even better, more lost pirate treasure… a series of pretty amazing comic strips he did called “Jack Daw’s Adventures.” Comics historian Allan Holtz, who is the guy who does the wonderful Stripper’s Guide blog, believes this strip is the very first syndicated adventure strip featuring a continuing character… and he has reprinted about 50 of them on his site. A panel sample can be seen below.